Type 4 phosphodiesterases (PDE4) are critical regulators in TCR signaling by attenuating the negative constraint of cAMP. 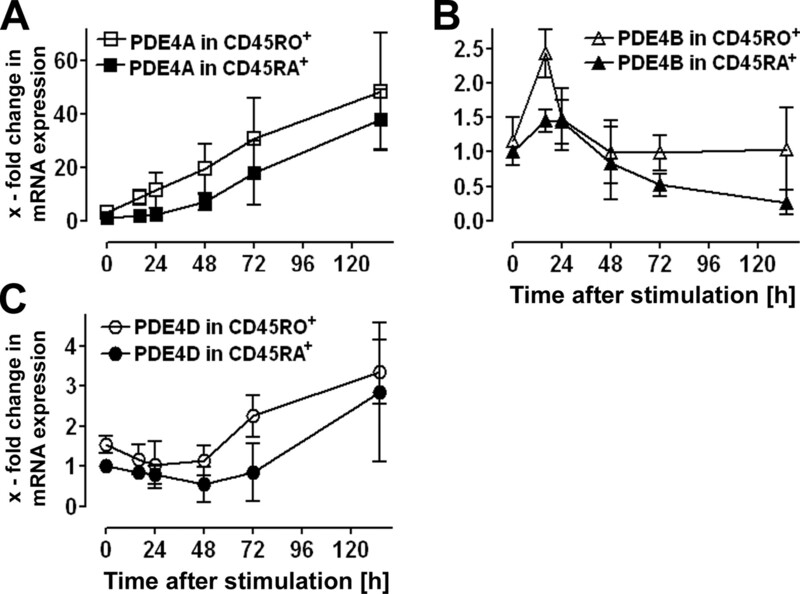 In this study, we show that anti-CD3/CD28 stimulation of human primary CD4+ T cells increases the expression of the PDE4 subtypes PDE4A, PDE4B, and PDE4D in a specific and time-dependent manner. PDE4A and PDE4D mRNAs as well as enzyme activities were up-regulated within 5 days, PDE4B showed a transient up-regulation with highest levels after 24 h. The induction was shown to be independent of different stimulation conditions and was similar in naive and memory T cell subpopulations. To elucidate the functional impact of individual PDE4 subtypes on T cell function, we used PDE4 subtype-specific short-interfering RNAs (siRNAs). Knockdown of either PDE4B or PDE4D inhibited IL-2 release 24 h after stimulation (time point of maximal IL-2 concentrations) to an extent similar to that observed with the panPDE4 inhibitor RP73401 (piclamilast). Substantial amounts of IFN-γ or IL-5 were measured only at later time points. siRNA targeting PDE4D showed a predominant inhibitory effect on these cytokines measured after 72 h. However, the inhibition of all cytokines was most effective when PDE4 siRNAs were applied in combination. Although the effect of PDE4 inhibition on T cell proliferation is small, the PDE4D-targeting siRNA alone was as effective as the panPDE4 inhibitor, whereas PDE4A or PDE4B siRNAs had hardly an effect. In summary, individual PDE4 subtypes have overall nonredundant, but complementary, time-dependent roles in propagating various T cell functions and PDE4D is the form likely playing a predominant role. The CD4+ Th cell plays a key role as a regulator of the immune system. The major task of CD4+ T lymphocytes in initiating the adaptive immune response is the recognition of Ags and the subsequent release of cytokines as mediators of immunity and inflammation (1, 2). However, various negative regulators of immunoreceptor signaling ensure that CD4+ T cells either maintain the quiescent state of unstimulated, mature T cells or limit and terminate the activating signal, and therefore restore the dormant state of T cells (3, 4). The second messenger cAMP has been recognized as an important mediator of such inhibitory signaling mechanisms by activation of the cAMP-protein kinase A (PKA),3 with PKA functioning as a gatekeeper of tonic inhibition in T cells (5, 6, 7, 8, 9, 10). Paradoxically, stimulation of the TCR initially elevates intracellular cAMP levels (11, 12). As a consequence, to abolish the inhibitory tone of cAMP and for T cell activation to occur, AgR-mediated signaling must involve effective local cAMP hydrolyzing capacities. Cyclic nucleotide hydrolyzing phosphodiesterases (PDEs), which comprise a large superfamily of 11 families termed PDE1–PDE11 (13, 14), play a fundamental role in regulating T cell signaling. Several cAMP-hydrolizing PDEs have been found in T cells and T cell lines, namely PDE1, PDE3, PDE4, PDE7, and PDE8, with PDE4 being the predominant family (15, 16, 17, 18). The PDE4 family comprehends four genes coding the subtypes PDE4A, PDE4B, PDE4C, and PDE4D. By the complex arrangement of transcriptional units and multiple promoters, >20 PDE4 isoforms (splice variants) have been described with unique N-terminal properties, enabling complex regulation mechanisms and intracellular compartmentalization. Based on sequence similarities, all four PDE4 subtypes show a related structural organization with a highly conserved catalytic domain in the C-terminal region and the so-called “upstream-conserved regions” in the N-terminal portion of the protein. Splice variants from all PDE4 subtypes are categorized in either PDE4 long or short forms depending on the length of the N-terminal part with the existence of either two or just one upstream-conserved region, respectively (19, 20). Over the past years, the development of PDE4 inhibitors as anti-inflammatory and immunomodulatory drugs has been a major focus of pharmaceutical research for the treatment of asthma and other chronic inflammatory diseases (21, 22). By increasing intracellular cAMP levels, PDE4 inhibitors have been shown to broadly target inflammatory and immunocompetent cells and are also capable to inhibit T cell functions like cytokine release and proliferation (23, 24). Current PDE4 inhibitors do not discriminate between distinct PDE4 subtypes. However, evidence derived from PDE4 knockout mice demonstrates that PDE4 subtypes are nonredundant, indicating that distinct PDE4 subtypes have distinct functional roles in inflammatory and immunocompetent cells, such as macrophages, smooth muscle cells, and neutrophils (25, 26, 27, 28). In T cells, the impact of PDE4 subtypes on T cell function is still unclear. PDE4B2 has been found to be associated with the CD3ε chain of the human TCR complex (29) and overexpression of PDE4B2 in Jurkat cells localizes to the immunological synapse upon activation, correlating with an increase in IL-2 production (30). In a recent study, Tasken and coworkers (31) reported that TCR and CD28 stimulation in human peripheral T cells recruits PDE4A4, PDE4B2, PDE4D1, and PDE4D2 in complex with β-arrestin to lipid rafts, pointing to a potential role of individual PDE4 isoforms in opposing the TCR-induced production of cAMP. However, the precise expression pattern of PDE4 subtypes and their functional consequences for T cell responses remain speculative. In the present study, we investigated the expression profiles of PDE4 subtypes in anti-CD3/CD28-stimulated human primary CD4+ T cells. To ascertain the functional role of PDE4 subtypes in these cells, we applied a small-interfering RNA (siRNA)-mediated, PDE4 subtype-specific knockdown strategy. We reveal that the subtypes PDE4A, PDE4B, PDE4C, and PDE4D exhibit distinct expression levels in CD4+ T cells and that upon anti-CD3/CD28 stimulation the subtypes are differently regulated, with PDE4 short forms accounting for an up-regulation in a time-dependent manner. We demonstrate that a siRNA-based electroporation technique is a reliable tool to generate PDE4 subtype-specific mRNA and protein knockdown in human primary CD4+ T cells. Finally, we provide evidence that PDE4 subtypes have an overall nonredundant, but complementary role in propagating various T cell functions upon TCR stimulation, such as cytokine release (IL-2, IFN-γ, IL-5) and proliferation. We suggest that PDE4B and PDE4D might be involved in regulating “short-term” TCR signals, such as IL-2 release, and that PDE4D plays a predominant role in propagating “long-term” TCR signals, such as IFN-γ release, IL-5 release, and proliferation. Percoll, Sepharose A, and G, 5,8-[3H]cAMP, and [3H]thymidine were obtained from Amersham Biosciences (GE Healthcare). 4-(2-Aminoethyl)-benzenesulfonyl fluoride and complete mini protease inhibitor (EDTA-free) were from Roche. Medium and solutions used for culturing of CD4+ T cells were purchased from Invitrogen Life Technologies. All other chemicals not specifically mentioned were of analytical grade and were obtained from Sigma-Aldrich. The PDE4 inhibitor RP73401 (piclamilast, WO9212961) was synthesized at the chemical facilities of Altana Pharma. The PDE4 inhibitor rolipram was purchased from Sigma-Aldrich. Forward/reverse primer and probe sets and TaqMan universal PCR master mix for quantitative PCR were purchased from Applied Biosystems. The designed primer and probe sets were as follows: 18S rRNA (X03205) forward, CGGCTACCACATCCAAGGAA, reverse, GCT GGAATTACCGCGGCT, probe VIC-TGCTGGCACCAGACTTGCCCTC; PDE4A (NM_006202) forward, GTGGCTCCGGATGAGTTCTC, reverse, GGGCTGCTGTGGCTTACAG, probe FAM-CCGGGAGGAATTCGTGGT-minor groove binder (MGB); PDE4B (NM_002600) forward, AGCAGCACAAAGACGCTTTGT, reverse, TCAGTCTCTCCCAGGGAATCTC, probe FAM-TGATTGATCCAGAAAAC-MGB; PDE4C (NM_000923) forward, ACTCTGGAGGAGGCAGAGGAA, reverse, AGGCAACTCCAAGGCCTCTT, probe FAM-AAGAGACAGCTTTAGCC-MGB; PDE4D (NM_006203) forward, GGCAGGGTCAAACTGAGAAATT, reverse TGACTGCCACTGTCCTTTTCC, probe FAM-TAGAGGAAGATGGTGAGTCAG-MGB. The PDE4 subtype primer/probe sets have been designed to bind at the 3′ end of the open reading frame of each subtype, at positions where individual splice variants of one subtype are identical. For the stimulation of human primary CD4+ T cells, anti-CD3 mAb (Orthoclone OKT-3; Janssen-Cilag) and anti-CD28 mAb (clone CD28.2; Immunotech) were used. The rabbit polyclonal Abs AC55 (anti-PDE4A) and K118 (anti-PDE4B) as well as the murine mAb m3S1 (anti-PDE4D), all applied for immunoprecipitations, were used as described (32). Purified mouse myeloma IgG1 as isotype control was purchased from Zymed (Invitrogen Life Technologies). For immunoblotting experiments, rabbit polyclonal Abs raised against PDE4A, PDE4B, and PDE4D were used as detailed elsewhere (33). Mouse monoclonal anti-β-actin Abs were purchased from Sigma-Aldrich. siRNAs were from Dharmacon (Lafayette): PDE4A_si (D-007647-04, GUAACAGCCUGAACAACUC), PDE4B_si (D-007648-04, GAAAGAGACCUCCUAAAGA), PDE4D_si (D-004757-06, GAACUUGCCUUGAUGUACA), PDE4D_si-2 (D-004757-05, GAAAUCAAGUGUCAGAGUU). As control, nontargeting NEG_si (more than four mismatches to every known human gene, D-001210-01) was used. Research conducted for this study with human material has been approved by the local ethics committee. For the isolation of human peripheral CD4+ T cells by negative selection, 250 ml of blood from normal, healthy donors were taken by antecubital venipuncture, 0.3% (w/v) citrate-treated, and diluted 1.6-fold with PBS before centrifugation at room temperature for 10 min at 220 × g. The lower phase was layered on a Percoll gradient (density 1.077 g/ml) and subject for centrifugation for 25 min at 800 × g. The interphase containing the PBMC was washed twice in PBS containing 2 mM EDTA and was then resuspended on ice in PBS, 0.5% (v/v) heat-inactivated FCS, 2 mM EDTA and prepared for magnetical separation using the autoMACS system (Miltenyi Biotec), as described by the manufacturer (CD4+ T Cell Isolation kit II, Program Deplete; Miltenyi Biotec). For the isolation of naive (CD45RA+) and memory (CD45RO+) T cells, CD4+ T cells of one donor were separated into two parts, and each part was labeled with anti-CD45RA or anti-CD45RO microbeads (Miltenyi Biotec), respectively, for magnetic separation. For flow cytometrical analysis (Coulter Epics XL-MCL; Beckman Coulter), 2–5 × 105 cells in 100 μl of staining buffer (PBS, 2% (v/v) heat-inactivated FCS) were labeled with Abs directed against surface markers CD4 and CD25 (Immunotech). Surface marker-specific Abs were used in combination with their respective isotype controls. The dye 7-aminoactinomycin D (7-AAD) was used to check for viability (Immunotech). Transfection of human peripheral, freshly isolated CD4+ T cells (5 × 106 cells/transfection) was conducted using the nucleofector kit for unstimulated human T cells according to the instructions of the manufacturer (nucleofector device I, program U-14; Amaxa) (34). At standard conditions, final siRNA concentrations were 1.5 μM in a total volume of 100 μl. Immediately after nucleofection (NF), cells were recovered with 2.5 ml of prewarmed complemented medium (RPMI 1640 medium, 10% (v/v) heat-inactivated FCS, 1% (v/v) l-glutamine, 100 U/ml penicillin, and 0.1 mg/ml streptomycin), transferred to 6-well plates (Corning Costar), and incubated in a humidified incubator at 37°C/5% CO2. For control experiments, nucleofection was performed without siRNA (= NF control) or with nontargeting siRNA (= NEG_si). After 24 h of culturing, transfected cells were checked for viability by flow cytometry and diluted to a concentration of 1 × 106 cells/ml. To test the nucleofection efficiency, different concentrations of FITC-labeled nontargeting siRNA (BLOCK-iT Fluorescent Oligo, Sequitur; Invitrogen Life Technologies) were transfected. For functional analysis, CD4+ T cells were stimulated via the CD3 chain of the TCR and the costimulatory molecule CD28, similar to a protocol described elsewhere (24). To coat 96-well microtiter plates (Microtest tissue culture plate, Falcon; BD Biosciences) with anti-CD3 mAbs, the plates were incubated for 2.5 h at 37°C/5% CO2 with 50 μl of a 6 or 60 μg/ml solution of anti-CD3 in PBS, corresponding to 0.3 or 3 μg anti-CD3/well, respectively. A total of 2 × 105 cells in a total volume of 200 μl was used per well. For costimulation, soluble anti-CD28 mAb in a volume of 10 μl was added to each well to obtain final concentrations of ∼0.3 or ∼3 μg of anti-CD28/ml, respectively. Optionally, the PDE4 inhibitor RP73401 (piclamilast) was included at a final concentration of 1 μM. Stock solutions of RP73401 in DMSO were diluted 1/1000 (v/v) to result in a final DMSO concentration of 0.1% (v/v) in the assay. Cells were incubated at 37°C/5% CO2, for several time periods, as indicated. Every condition was performed at least in duplicates. A total of 0.1–1 × 107 CD4+ T cells were washed in PBS, lysed with 350 μl of RNA lyses tissue buffer containing 1% 2-ME, and homogenized with QIAshredder spin columns (Qiagen). Total RNA was isolated using RNeasy mini columns according to the instructions of the manufacturer (Qiagen). RNA concentration was determined by spectrophotometric analysis using a SpectraMax 190 (Molecular Devices) or a NanoDrop ND-1000. The average yield was determined to be ∼0.8 μg of total RNA per 1 × 106 unstimulated human primary CD4+ T cells. Reverse transcription was performed with 0.5–1 μg of RNA using AMV reverse transcriptase (Roche). Quantitative PCR were performed on an ABI Prism 7900 HT sequence detection system (Applied Biosystems). Primer and probe sets have been tested for specificity and were optimized to have similar maximal amplification efficiencies (95 ± 3%, data not shown) in duplex reactions (i.e., combined detection of 18S rRNA and a target gene). Standard quantitative PCR were performed in a total volume of 25 μl in triplicates, each containing 10 ng of cDNA as template, 50 nM of primer and probe detecting 18S rRNA, and 900 nM/200 nM primer/probe detecting the target gene in 1× TaqMan universal PCR master mix (Applied Biosystems). The thermal cycler protocol consisted of a 2-min period at 50°C (uracil removal for PCR carryover protection), a 10-min period at 95°C (denaturation of native DNA), and of 40 cycles of 15 s at 95°C (denaturation of PCR product) and 1 min at 60°C (annealing/extension). As controls for DNA contamination, total RNA and water were taken as templates. For control experiments, plasmids were used containing conserved C-terminal parts of the subtypes PDE4A, PDE4B, PDE4C, and PDE4D. Quantification of PCR experiments was based on the comparative ΔΔ cycle threshold (Ct) method as described elsewhere (35) using either unstimulated cells or nucleofection control cells as calibrator. Cells were washed in PBS and resuspended in lysis buffer (50 mM Tris-HCl (pH 7.4), 10 mM sodium fluoride, 1 mM EDTA, 0.2 mM EGTA, 10 mM sodium pyrophosphate, 250 mM sodium chloride, 5% glycerol, 1 mM 4-[2-aminoethyl]-benzenesulfonyl fluoride, 1 tablet/10 ml complete protease inhibitor, 1 mM sodium orthovanadate, 1% Nonidet P-40 (Calbiochem), and 15 mM 2-ME). After sonication, the lysate was centrifuged at 4°C for 20 min at 16,000 × g. The protein concentration in the supernatant was determined using Bio-Rad protein assay dye reagent concentrate according to the instructions of the manufacturer (Bio-Rad). Immunoprecipitation and subsequent activity assays for the determination of both total PDE activity and PDE4 inhibitor-insensitive PDE activity (in the presence of 10 μM rolipram) were conducted in accordance with a method described earlier (28). Alternatively, cells were resuspended in homogenization buffer (20 mM Tris-HCl (pH 7.6), 140 mM sodium chloride, 3.8 mM potassium chloride, 1 mM EGTA, 1 mM magnesium chloride, 0.5 mM 4-[2-aminoethyl]-benzenesulfonyl fluoride, 10 μM leupeptin, 2 mM benzamidine, 10 μM pepstatin A, 5 μM trypsin inhibitor, 1 mM 2-ME). After sonication, the lysate was centrifuged at 4°C for 20 min at 1000 × g. Total PDE and PDE4 inhibitor-insensitive PDE activity (in the presence of 1 μM piclamilast) were assayed as described previously (24). Briefly, 5–20 μg of protein were diluted in 20 mM Tris-HCl (pH 7.8) to a final volume of 150 μl, either including 0.1% DMSO or PDE4 inhibitor. After preincubation at 37°C for 5 min, assay mixture (final 20 mM Tris-HCl (pH 7.8), 5 mM magnesium chloride, 0.5 μM cAMP, 100 μM EGTA, and ∼30,000 cpm/assay [3H]cAMP) was added and the samples were incubated at a final volume of 200 μl at 37°C for 20 min. The reaction was stopped with 0.2 N HCl (4°C) on ice. Following incubation at 37°C for 15 min with 25 μg of 5′-nucleotidase (Crotalus atrox snake venom; Sigma-Aldrich), the assays were loaded on Poly-Prep chromatography columns (Bio-Rad) filled with 1 ml of QAE Sephadex A-25 (Sigma-Aldrich). [3H]Adenosine was eluted with 2 ml of 30 mM ammonium formiate (pH 6.0), mixed with 3 ml of scintillation fluid (Lumasafe Plus; Lumac), and measured for total radioactivity in a scintillation counter (Beckman Coulter). Results were corrected for blank values (measured in the presence of denatured protein) and the PDE4 activity was calculated as the difference of total PDE activity and PDE4 inhibitor-insensitive PDE activity. In all PDE assays, the amount of cAMP hydrolyzed was below 25% of the original substrate concentration. Cells were washed in PBS and resuspended in lysis buffer (150 mM sodium chloride, 5 mM EDTA, 50 mM Tris-HCl (pH 7.4), 0.1% sodium azide, 0.5% Triton X-100, 0.5 mM 4-[2-aminoethyl]-benzenesulfonyl fluoride, 10 μM leupeptin, 2 mM benzamidine, 10 μM pepstatin A, 5 μM trypsin inhibitor) at ∼1.5 × 107 cells per 100 μl of lysis buffer. Protein determination, SDS-PAGE, and immunodetection of PDE4 subtypes were performed as detailed elsewhere (33). Modifications were the use of 50 μg of protein per lane, the transfer to nitrocellulose membranes, a semidry blotting technique (Bio-Rad), and the immunodetection with ECL advance Western blotting detection reagent (Amersham Biosciences). Detection of β-actin was used as loading control. As parameter for T cell function after anti-CD3/CD28-induced stimulation, cytokine concentrations of IL-2, IFN-γ, and IL-5 in the culture medium were measured. Supernatants were removed after 24 or 72 h, pooled, and stored at −80°C until specific commercially available enzyme-linked immunosorbent assays (IL-2, IFN-γ, and IL-5 assay kits; Immunotech) were performed. Due to the high variability of cytokine levels from different blood donors and the comparable narrow linear range of the ELISA standard curve, appropriate dilution factors have been determined before the analysis. Dilutions were performed in the buffers equipped in the assay kits. All cytokines were determined from the pool fraction in duplicate in accordance with the manufacturer’s instructions (Immunotech). The incorporation of [3H]thymidine was taken as a parameter to determine CD4+ T cell proliferation. After 48 h of stimulation, 10 μl of [3H]thymidine (0.2 μCi/well) were added to the cells in duplicates for a period of 18 h until cell transfer and radioactivity measurement, as detailed elsewhere (24). Averages are presented as mean ± SD. For statistical analysis, ANOVA (ANOVA, GraphPad Prism 4.0; GraphPad Software) was used. Densitometric analysis of immunoblots was performed with the Advanced Image Data Analyzer (AIDA 3.22; Raytest). The primer and probe sets for quantitative PCR analysis were designed using Primer Express 2.0 (Applied Biosystems). Primary CD4+ T cells isolated from human whole blood by negative selection using magnetic bead cell separation were used in all experiments. With this approach, we obtained CD4+ cells of 94–99% purity as measured by flow cytometry analysis (data not shown). To mimic the physiological conditions of T cell activation, we stimulated the cells via the TCR (by plate-bound anti-CD3 Abs) and the CD28 coreceptor (by soluble anti-CD28 Abs). For quantitative RT-PCR experiments, we designed primer/probe sets specific for each of the four PDE4 subtypes. To monitor the amount of template in different reactions, we used 18S rRNA as internal standard, which we had shown not to be differentially expressed upon T cell stimulation (data not shown). In validation experiments, we tested the primer/probe sets for the PDE4 subtypes in combination with the primer/probe set detecting 18S rRNA (duplex PCR). Because all PDE4 subtype primer/probe sets showed similar maximal efficiencies in standardized PCR (95 ± 3%, data not shown), we concluded that PDE4 expression patterns could also be directly compared. In unstimulated CD4+ cells, we detected mRNA expression of the PDE4 subtypes PDE4A, PDE4B, and PDE4D. Although the PDE4C primer/probe set is functional in control experiments, we never detected expression of PDE4C in CD4+ cells, regardless of whether the cells were stimulated or not. The highest mRNA expression level was found for PDE4D (∼12-fold higher than PDE4A) followed by PDE4B (∼8-fold higher than PDE4A) and PDE4A (set to 1 as reference) (Fig. 1⇓A). We then investigated whether the PDE4 subtypes are differentially expressed upon stimulation. Therefore, cells were stimulated with anti-CD3/CD28 for different periods of time. For each gene, the expression in unstimulated cells (time point 0 h) was used as reference point. Upon stimulation, PDE4A mRNA was steadily up-regulated and had a ∼15-fold higher expression after 120 h (Fig. 1⇓B). PDE4B mRNA was up-regulated ∼2-fold within the first 16 h, returned to basal level after 48 h, and further decreased at later times, indicating a transient up-regulation of this subtype (Fig. 1⇓C). PDE4D mRNA expression slightly decreased within the first 24 h after stimulation, but was then steadily up-regulated and reached a ∼4-fold higher expression after 120 h, indicating a long-term up-regulation of this subtype (Fig. 1⇓D). 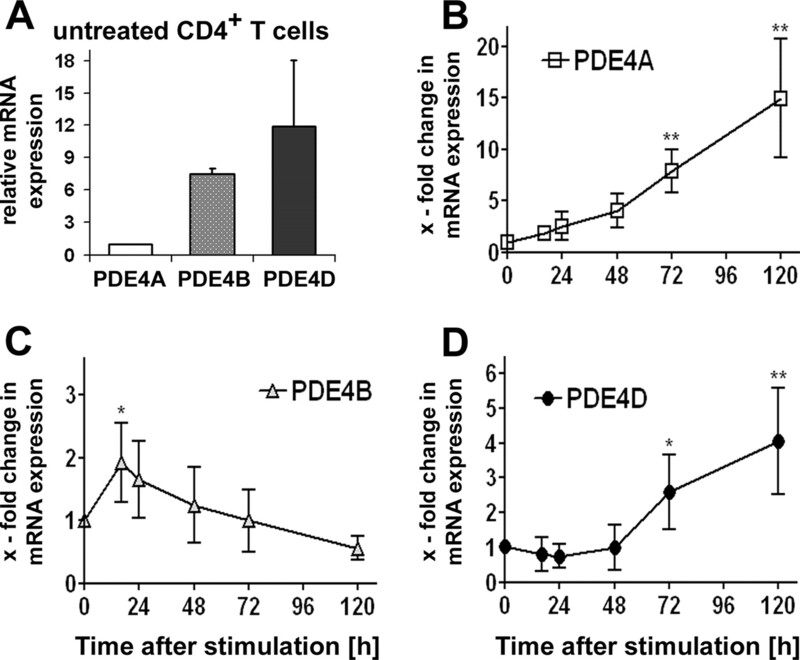 PDE4A, PDE4B, and PDE4D mRNA expression in untreated and anti-CD3/CD28 stimulated human primary CD4+ T lymphocytes. Cells were separated from whole blood as described in Materials and Methods and were subject for total RNA isolation and cDNA transcription. Quantitative PCR was performed using ribosomal 18S rRNA as internal standard (detected after 10–13 cycles) and specific primer/probe sets for PDE4A, PDE4B, PDE4C, and PDE4D. By comparing ΔCt values, the expression level of individual PDE4 subtypes was reported relative to PDE4A, which was detected after 27–30 cycles (ΔCt ∼17) (A). After stimulation with 3 μg anti-CD3/well and 3 μg anti-CD28/ml, time-dependent mRNA expression for PDE4A (B), PDE4B (C), and PDE4D (D) was measured relative to untreated conditions (t = 0 h). PDE4C transcripts were not detected after 40 cycles. Results are expressed as mean ± SD of four donors. Significance of differences is indicated: ∗, p < 0.05; ∗∗, p < 0.01; B–D, compared with untreated cells (t = 0 h). To obtain an overall picture of the PDE4 subtype expression after T cell stimulation, we combined the different expression levels (Fig. 1⇑A) with the time courses of each individual subtype (Fig. 1⇑, B–D), using the expression level of PDE4A mRNA in unstimulated cells as reference for all other data points (Fig. 2⇓A). Due to the considerably high PDE4B mRNA levels in untreated CD4+ T cells, the ∼2-fold up-regulation after 16 h stimulation lead to the predominant expression of this subtype at 16 and 24 h. From 48 h onward, the induction of PDE4D and the decrease of PDE4B resulted in PDE4D being the predominant subtype. PDE4A mRNA displayed the lowest expression level up to 48 h after stimulation. Due to the steady up-regulation of this subtype and the down-regulation of PDE4B at later time points, the expression level of PDE4A exceeded that of PDE4B at 120 h but still did not reach the high expression level of PDE4D. Time-dependent mRNA expression profiles of PDE4 subtypes in CD4+ T cells by different anti-CD3/CD28 stimulation. The quantitative mRNA expression levels of PDE4A, PDE4B, and PDE4D in untreated cells (shown in Fig. 1⇑A) were combined with the respective time courses (shown in Fig. 1⇑, B–D). All data were expressed relative to the PDE4A expression level in untreated cells (t = 0 h). Thereby, the complete quantitative mRNA expression pattern of the PDE4 subtypes was obtained for cells stimulated with 3 μg anti-CD3/well and 3 μg anti-CD28/ml (A). The same sets of experiments were performed with cells stimulated with 0.3 μg of anti-CD3/well and 0.3 μg of anti-CD28/ml (B), with 3 μg of anti-CD3/well alone (C), and with 0.3 μg anti-CD3/well alone (D). Results in A are expressed as mean ± SD of four donors. Results in B–D are the average of two donors. To examine whether the distinct regulation of individual PDE4 mRNA levels is dependent on the anti-CD3:anti-CD28 ratio and subsequently on the costimulatory anti-CD28 stimulus, we activated CD4+ T cells with 0.3 μg of anti-CD3/well in combination with 0.3 μg of anti-CD28/ml (Fig. 2⇑B), with 3 μg of anti-CD3/well alone (Fig. 2⇑C), or with 0.3 μg of anti-CD3/well alone (Fig. 2⇑D). All conditions resulted in similar time-dependent expression patterns as were found for the strong stimulation with 3 μg of anti-CD3/well plus 3 μg of anti-CD28/ml shown in Fig. 2⇑A, hereby confirming the long-term induction of PDE4A and PDE4D and the transient up-regulation of PDE4B. For all additional experiments related to PDE4 subtype expression, either on mRNA, enzyme activity, or protein level, we used this latter stimulation condition. Because CD4+ T cells isolated from human whole blood still represent a rather heterogeneous population of cells, we investigated whether different subpopulations of CD4+ cells may regulate the PDE4 subtype expression specifically. Therefore, we studied the expression patterns separately in naive CD4+ T cells characterized by the surface marker CD45RA and in memory CD4+ T cells expressing the marker CD45RO (36). Due to the isolation strategy (see Material and Methods), we obtained CD45RA+CD4+ T cells (>95% pure) and CD45RO+CD4+ T cells (>98% pure), whereas cells coexpressing CD4, CD45RA, and CD45RO were sorted out. In unstimulated naive CD4+ T cells, we found slightly lower levels of PDE4A, PDE4B, and PDE4D transcripts compared with unstimulated memory CD4+ T cells (Fig. 3⇓, A–C). After anti-CD3/CD28 stimulation, memory CD4+ T cells showed a slightly faster up-regulation of PDE4A (Fig. 3⇓A) and PDE4D (Fig. 3⇓C), as well as a more pronounced transient up-regulation of PDE4B (Fig. 3⇓B) compared with naive CD4+ T cells. However, these differences in the regulation of individual PDE4 subtypes between naive and memory CD4+ T cells were not statistically significant. Because the expression profiles of PDE4 subtypes both in naive and memory CD4+ T cells were found to be very similar, all following experiments were performed with CD4+ cells that were not further separated. mRNA expression profiles of PDE4 subtypes in CD45RA+ (naive) and CD45RO+ (memory) human primary CD4+ T lymphocytes. CD4+ cells were further purified by negative selection using either anti-CD45RA or anti-CD45RO microbeads. Cells were stimulated with 3 μg of anti-CD3/well and 3 μg of anti-CD28/ml for different periods of time. Subsequent experiments were performed as outlined in the legend of Fig. 1⇑. Expression profiles of PDE4A (A), PDE4B (B), and PDE4D (C) from both T cell subpopulations are shown. Results are expressed relative to untreated conditions in naive T cells (t = 0 h), as mean ± SD of four donors. Differences between naive and memory cells were statistically not significant. Changes in mRNA levels do not necessarily result in changes of the respective protein levels. Therefore, we investigated whether the induction of PDE4 subtypes observed in quantitative PCR experiments translates in an increase in PDE4 enzyme activity. 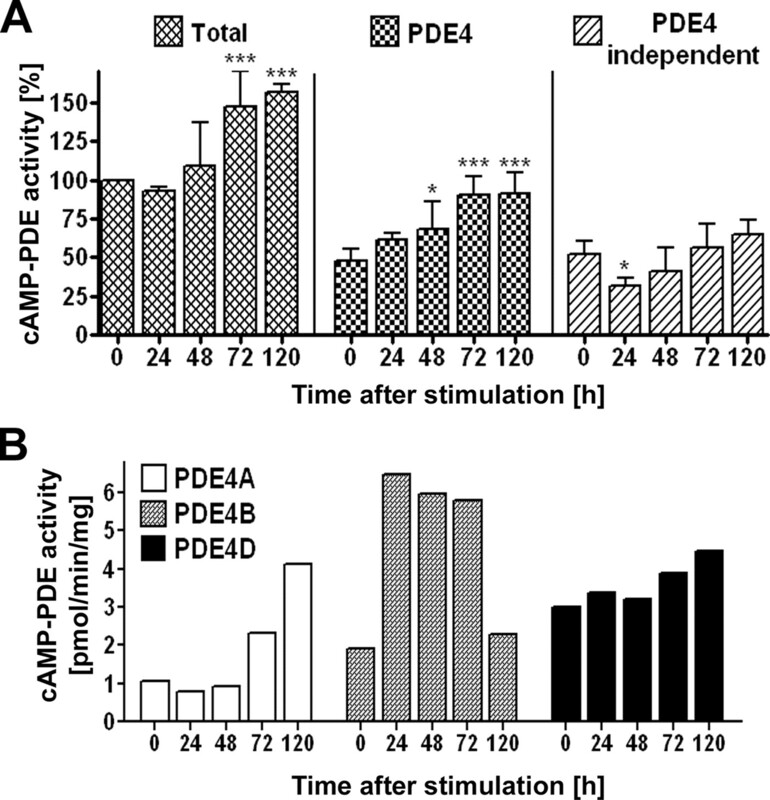 Upon stimulation, total cAMP-hydrolizing PDE activity (mean ± SD = 37 ± 16 pmol/min/mg in resting cells) was augmented in a time-dependent manner (Fig. 4⇓A), resulting in a significantly higher activity 72 and 120 h after stimulation. This increase was mainly due to an increase in PDE4 activity, whereas PDE4-independent enzyme activity initially decreased 24 h after stimulation and recovered to baseline levels during the time period studied. cAMP hydrolyzing phosphodiesterase activity in untreated and anti-CD3/CD28 stimulated human primary CD4+ T lymphocytes. Cells were stimulated with 3 μg of anti-CD3/well and 3 μg of anti-CD28/ml for different periods of time. A, Total cAMP-PDE hydrolyzing activity and PDE4 inhibitor-insensitive PDE activity (= PDE4 independent) in T cell lysates were measured as detailed in Materials and Methods. PDE4 activity was determined by subtracting the PDE4 independent activity from the total activity. Data are expressed as mean ± SD of three to five donors. ∗, p < 0.05; ∗∗∗, p < 0.001 (compared with untreated cells, t = 0 h). B, Cell lysates were immunoprecipitated with Abs recognizing PDE4A (AC55), PDE4B (K118), and PDE4D (m3S1) (32 ). The PDE activity recovered in the immunoprecipitation pellet was measured as detailed in Materials and Methods. Shown is one representative experiment of three. For the experiment, CD4+ cells of three donors were independently stimulated, but pooled for lysis and immunoprecipitation. To ascertain which PDE4 subtypes contribute to this up-regulation, an immunoprecipitation strategy was applied with Abs specific for PDE4A, PDE4B, and PDE4D. After precipitation, the samples were assayed for PDE4 cAMP hydrolyzing activity. In unstimulated CD4+ T cells (time point 0 h in Fig. 4⇑B), the highest activity was measured in samples precipitated with the PDE4D-specific Ab. Whereas PDE4B activity was somewhat lower than PDE4D activity, PDE4A contributed least to the total PDE4 activity. However, after anti-CD3/CD28 stimulation, PDE4A activity was greatly induced starting at 72 h and reached a 4-fold higher activity at the end of the time period examined (Fig. 4⇑B). PDE4B activity was transiently up-regulated, peaking with a 3.4-fold higher activity at 24 h followed by a decrease. After 120 h, PDE4B activity was similar to the level observed in untreated cells. At this time point, PDE4A activity exceeded the PDE4B activity. Compared with untreated cells, PDE4D activity remained relatively constant during the first 48 h after stimulation, and increased at 72 and 120 h after stimulation totaling in a 1.5-fold up-regulation. Taken together, the pattern of PDE4 subtype-specific enzyme activities qualitatively closely resembled the mRNA expression profile. To elucidate which splice variants are expressed in untreated CD4+ T cells and may account for the measured changes in mRNA levels and protein activities after stimulation, we used Abs recognizing the conserved C termini of the PDE4 subtypes to perform immunoblotting experiments (Fig. 5⇓, A and B). In unstimulated T cells, a polyclonal Ab directed against PDE4A detected immunoreactivity at ∼130 kDa and with a very low density below 100 kDa, which can be attributed to long (PDE4A4, PDE4A10, and/or PDE4A11) and short (PDE4A1) PDE4A forms, respectively. Contrary to our mRNA and enzyme activity measurements, the intensity of the immunodetected signals did not show a long-term increase after stimulation with anti-CD3/CD28. A polyclonal Ab directed against PDE4B gave rise to two predominant bands. One band migrated slightly above 100 kDa and might be attributed to PDE4B long forms (PDE4B1 and/or PDE4B3). The high immunoreactivity in unstimulated cells decreased after stimulation during the examined time period (0–120 h). The other band, migrating at ∼75 kDa (might be attributed to PDE4B2) was also present in unstimulated cells, but was strongly induced, peaking 24–48 h after stimulation. At later time points, a reduction of this band was observed. Considering the transient induction of the subtype PDE4B measured by PCR and activity assays, the immunodetected down-regulation of long PDE4B splice variants is compensated by a pronounced up-regulation of the short splice variant and may result in a net up-regulation between 24 and 48 h after stimulation. A polyclonal Ab directed against PDE4D detected several bands of different molecular weights. One set of bands was in the range of ∼60–75 kDa and likely corresponds to the short forms PDE4D6 (∼59 kDa), PDE4D2 (∼68 kDa), and PDE4D1 (∼72 kDa). These short forms were up-regulated in a time-dependent manner, with the middle band, assumingly PDE4D2, showing the most pronounced up-regulation. The other set of bands was above ∼85 kDa and may be the long splice variants of PDE4D (PDE4D3, PDE4D4, PDE4D5, PDE4D7, PDE4D8, PDE4D9). These bands showed low immunoreactivities that were not, or only slightly, changed after stimulation. The unchanged immunodetection of β-actin as loading control confirmed that the observed regulation of PDE4 subtypes was not due to different amounts of protein loaded onto the gel. For quantification, densitometric analysis of PDE4 long and short forms and of β-actin was performed and expressed relative to untreated cells (Fig. 5⇓B). As indicated above, both PDE4B and PDE4D short forms are up-regulated, whereas PDE4B and PDE4D long forms are down-regulated or unaffected, respectively. Detection and quantification of PDE4 splice variants in untreated and anti-CD3/CD28-stimulated human primary CD4+ T lymphocytes by immunoblotting and densitometric analysis. Cells were stimulated with 3 μg of anti-CD3/well and 3 μg of anti-CD28/ml for different periods of time. Cells were lysed and 50 μg of protein of the 1000 × g supernatant were separated by SDS-PAGE. A, Immunoblots detecting PDE4A, PDE4B, and PDE4D splice variants. Immunodetection was performed using rabbit polyclonal Abs recognizing PDE4A, PDE4B, or PDE4D (33 ). β-Actin was used as loading control. Shown is one representative of two experiments with cells from three donors that have been independently stimulated, but pooled for lysis and immunoblotting. B, Densitometric analysis of PDE4 long and short forms and β-actin, each expressed relative to untreated conditions. PDE4A short forms were not analyzed quantitatively due to the very faint immunodetected signal. Shown are mean values of two independent experiments, each with cells from three donors that have been independently stimulated, but pooled for lysis and immunoblotting. In the following set of experiments, we addressed the question whether the specific expression patterns of PDE4 subtypes correlates with a respective relevance for different T cell functions. Because PDE4 inhibitors so far available are rather nonselective for PDE4 subtypes, we used a siRNA-based approach to selectively knockdown the different PDE4 subtypes. Although we used a comparatively high stimulation condition (3 μg of anti-CD3/well and 3 μg of anti-CD28/ml) for all PDE4 expression and activity studies to detect maximal effects in the regulation of PDE4 subtypes (Figs. 1–5⇑⇑⇑⇑⇑), we used a weaker stimulation condition (0.3 μg of anti-CD3/well and 0.3 μg of anti-CD28/ml) for all functional studies and therefore also for all siRNA validation experiments. This weaker stimulation was chosen because we had observed that full stimulation decreases the efficacy of PDE4 inhibitors (data not shown) and might thus also decrease functional effects of PDE4 subtype-specific siRNAs. To transfect human primary CD4+ T cells with siRNAs, we used the Amaxa NF technique (34). In a series of extensive control experiments, we tested this siRNA-based strategy for unspecific, cytotoxic effects. The nucleofection procedure alone (without siRNA) produced a considerable loss of cells (37 ± 10%), but had only a minor effect (5 ± 3%) on cell mortality of recovered cells, as measured by 7-AAD staining 24 and 48 h after nucleofection (Table I⇓). The release of cytokines was also affected by the nucleofection procedure, compared with untreated cells (45 ± 7%). In contrast, the expression of surface markers, such as CD4 and CD25 measured by flow cytometry, as well as cell proliferation was not changed by the nucleofection procedure. Although the nucleofection procedure alone had substantial effects on some of the measured parameters, the application of siRNA had no additional effects on any of the parameters investigated (see last column in Table I⇓). The transfection efficiency was tested with FITC-labeled nontargeting siRNA and resulted in ∼94% FITC-positive cells (Fig. 6⇓A). From sets of siRNAs specific for each PDE4 subtype, we selected those individual siRNAs that were most effective in down-regulating the respective mRNA (data not shown). Different siRNA concentrations were tested to determine the optimal concentration needed for mRNA knockdown (Fig. 6⇓B). In unstimulated CD4+ cells, individual siRNAs directed against PDE4A, PDE4B, and PDE4D concentration dependently induced specific mRNA knockdowns of each respective PDE4 subtype 24 h after transfection compared with nucleofection controls (NF control, cells transfected without siRNA) (Fig. 6⇓B). Maximal mRNA knockdown was achieved with 1.5 μM siRNA. Notably, the knockdown efficacy for every individual siRNA was within the same range of ∼59–65%. The siRNAs target sequences that are highly conserved between the different PDE4 subtypes. Although each siRNA is capable to efficiently down-regulate the corresponding mRNA, none of the used siRNAs did affect the highly homologous mRNAs of the other PDE4 subtypes. Additionally, nontargeting siRNA used as a negative control had no effect on the expression of PDE4A, PDE4B, and PDE4D mRNA (data not shown). Validation of siRNA-mediated knockdown of PDE4 subtypes in human primary CD4+ T lymphocytes. A, Transfection efficiency, tested by using 2 μM FITC-labeled siRNA. Uptake of siRNA was measured by flow cytometry. B, Concentration-dependent siRNA-mediated mRNA knockdown in unstimulated CD4+ T cells 24 h after nucleofection. Data are shown relative to each nucleofection (NF) control, as one representative of two experiments. C, Time-dependent siRNA-mediated mRNA knockdown after stimulation with 0.3 μg of anti-CD3/well and 0.3 μg of anti-CD28/ml. Results are expressed relative to the respective NF control as the mean ± SD of three to six donors. Significant differences between NF control and siRNA-transfected cells are indicated (∗, p < 0.05; ∗∗, p < 0.01; ∗∗∗, p < 0.001; compared with NF control of each time point). D, PDE activity knockdown, induced by PDE4 subtype-specific siRNAs, in CD4+ T cells 24 and 72 h after anti-CD3/CD28 stimulation. Results are expressed as cAMP-PDE activity in percent of the NF control, as mean ± SD of three donors. Significant differences between NF control and siRNA-transfected cells are indicated (∗∗, p < 0.01; ∗∗∗, p < 0.001; compared with NF control). To test whether the PDE4 subtype-specific siRNAs were also effective after stimulation, transfected cells were left unstimulated for 24 h to allow siRNA-mediated mRNA depletion before the addition of the anti-CD3/CD28 stimulus. Subsequently, the mRNA knockdown effects were determined at 24, 48, and 72 h after stimulation and were compared with the NF controls (Fig. 6⇑C) taken at the respective time point. Significant mRNA knockdowns were achieved up to 72 h after stimulation with all applied siRNAs, although the siRNA-mediated knockdown effects started to diminish. To ascertain that the mRNA knockdown translates into a decrease in protein level, we performed cAMP-PDE activity assays with lysates from siRNA-transfected CD4+ T cells (Fig. 6⇑D). Lysates from T cells treated only with the nucleofection procedure (NF control) were used as reference. Twenty-four hours after stimulation, a marginal reduction of total cAMP-PDE activity and PDE4 activity (mean ± SD = 10 ± 13%, NS) was achieved with siRNA directed against PDE4A. siRNAs directed against PDE4B and PDE4D significantly reduced total cAMP-PDE activity and PDE4 activity (PDE4B-siRNA: 28 ± 5%, PDE4D-siRNA: 51 ± 11%). To evaluate whether the knockdown effects on PDE4 activity were maintained for a longer time period, we repeated the PDE activity measurements at 72 h. At this latter time point, the reduction of PDE4 enzyme activity by the different siRNAs were similar to the 24-h time point (PDE4A-siRNA: 18 ± 9%, PDE4B-siRNA: 27 ± 14%, PDE4D-siRNA: 46 ± 7%). Considering that the individual PDE4 subtypes contribute quite differently to the overall PDE4 activity, it is expected that PDE4A siRNA will have the smallest effect on PDE4 activity whereas PDE4B and PDE4D siRNAs will have larger effects even when the individual subtypes are diminished to the same extend. Indeed, the collective effects of all individual PDE4 siRNAs sum up to ∼90% both after 24 and 72 h, indicating a pronounced efficacy of the siRNAs to down-regulate their respective subtype. Taken together, the strategy to selectively knockdown individual PDE4 subtypes in primary CD4+ T cells was well tolerated, specific, and efficient. Because enzymatic activity was effectively reduced 72 h after stimulation but mRNA levels started to recover at the same time, we considered the siRNA approach to be suitable for the application on functional T cell assays in a time period of up to 72 h.
To determine how human primary CD4+ T cells functionally respond to anti-CD3/CD28 stimulation, we measured IL-2, IFN-γ, and IL-5 secretion at different times in supernatants of stimulated cells (Fig. 7⇓A). In untreated cells (time point 0 h), IL-2, IFN-γ, as well as IL-5 levels were below the detection limit. After stimulation, IL-2 was strongly induced with maximal levels 24 h after stimulation, but returned to basal levels within 5 days. 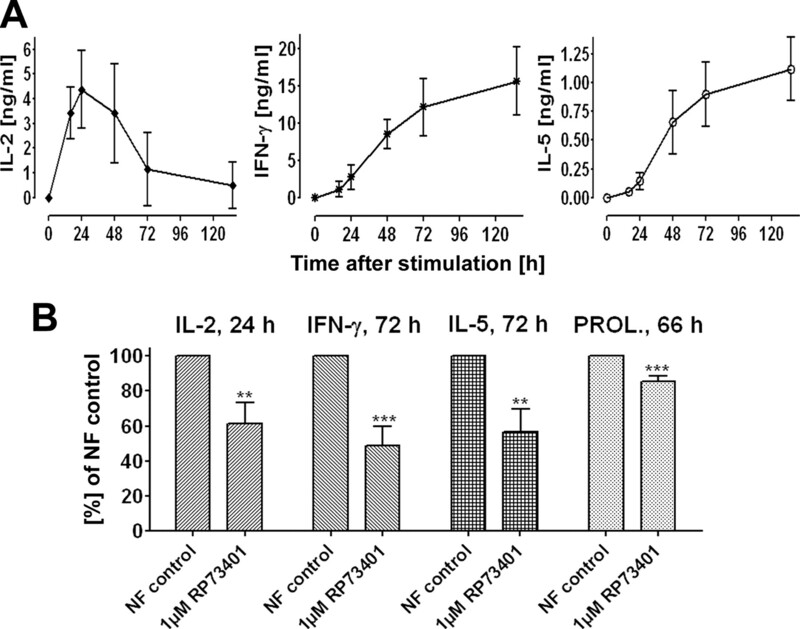 Compared with IL-2 secretion, IFN-γ and IL-5 levels were substantially induced at later time points, but were from 24 h onward steadily up-regulated and were maximal at the end of the examined time period (134 h). Time course of functional T cell parameters after anti-CD3/CD28 stimulation and suppression of T cell functions by complete PDE4 inhibition. A, Time-dependent cytokine secretion of CD4+ T cells (IL-2, IFN- γ, IL-5) after stimulation with 0.3 μg of anti-CD3/well and 0.3 μg of anti-CD28/ml. Supernatants were collected and cytokine concentrations were determined by ELISA. Results are expressed as mean ± SD of four donors. B, Suppression of CD4+ T cell functions by the panPDE4 inhibitor RP73401 (piclamilast). Cells treated with the nucleofection procedure alone (NF control) were incubated for the indicated period of time after anti-CD3/CD28 stimulation either in the presence of 0.1% DMSO or additionally in the presence of 1 μM RP73401. Data are shown as mean ± SD (%) of four to six donors. Significance of differences is indicated: ∗∗, p < 0.01; ∗∗∗, p < 0.001; compared with NF control (+0.1% DMSO). To investigate how T cell functions are affected by PDE4 inhibition, we treated CD4+ cells with the very potent panPDE4 inhibitor RP73401 (piclamilast), which does not discriminate between distinct PDE4 subtypes (24), and stimulated the cells for the indicated time periods (Fig. 7⇑B). To compare the effects of RP73401 with the effects of PDE4 subtype-specific siRNAs, we used cells treated with the nucleofection procedure for the RP73401 experiments, but did not apply siRNA. To adjust the control conditions for DMSO concentrations, we treated transfected cells with 0.1% DMSO and set the measured cytokine level and proliferation rate of these cells to 100%. A total of 1 μM RP73401 (a maximum concentration that guarantees PDE4 selectivity, data not shown) significantly inhibited anti-CD3/CD28 induced IL-2 release (∼39 ± 12% inhibition, 24 h after stimulation), IFN-γ release (∼52 ± 11% inhibition, 72 h after stimulation), and IL-5 release (∼43 ± 13% inhibition, 72 h after stimulation) (Fig. 7⇑B). Under these conditions, proliferation was also significantly inhibited, but to a lesser extent (∼13 ± 4% inhibition, 66 h after stimulation). To ascertain which individual PDE4 subtype(s) mediate the inhibitory effect of a panPDE4 inhibitor, PDE4 subtype-specific siRNAs were nucleofected into CD4+ T cells. After a 24-h resting period, transfected cells were stimulated with anti-CD3/CD28. A total of 1.5 μM nontargeting siRNA was used as control for statistical analysis (NEG_si in Fig. 8⇓). The functional impact of individual siRNAs on cytokine release and on cell proliferation is reported as a percentage of the RP73401 effect, which can be assumed to represent the maximal effect and was set therefore to 100%. Comparable to Fig. 7⇑B, cells treated with the nucleofection procedure alone were used to determine these maximal effects. 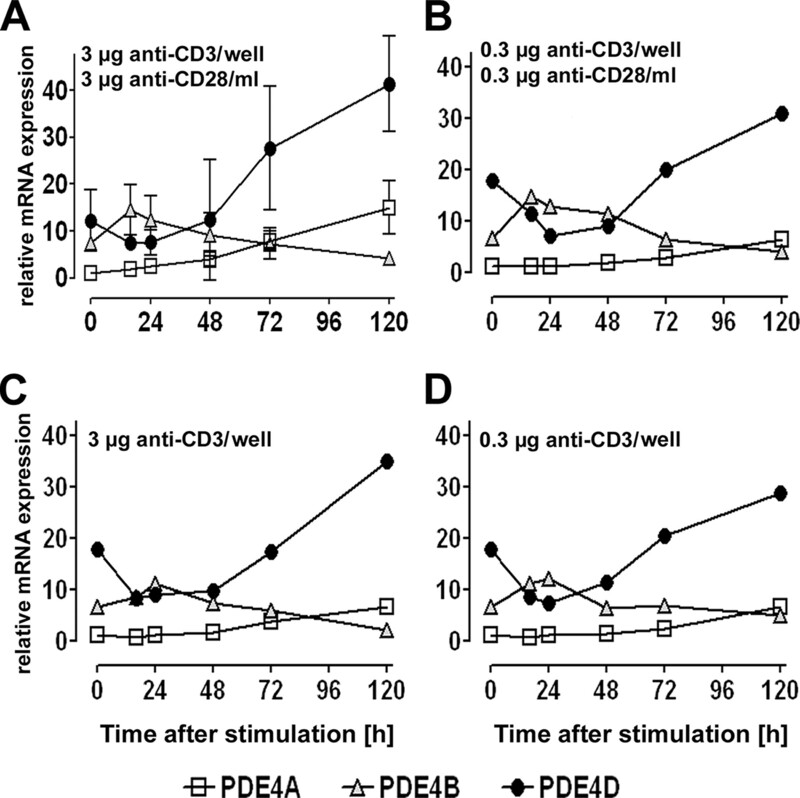 Twenty-four hours after stimulation, siRNA targeting PDE4A showed no significant inhibitory effect on IL-2 synthesis, however, knockdown of either PDE4B or PDE4D significantly suppressed anti-CD3/CD28 induced IL-2 release to an extent close to that observed with RP73401 (Fig. 8⇓A). Because substantial amounts of IFN-γ and IL-5 were only measured at later time points, the functional impact of PDE4 subtype-specific siRNAs on these latter cytokines was measured 72 h after stimulation. siRNA targeting PDE4A had no significant inhibitory effect on IFN-γ release. siRNA targeting PDE4B had a slightly higher inhibitory effect, however, siRNA targeting PDE4D showed the most pronounced inhibitory effect on IFN-γ synthesis similar to RP73401 (Fig. 8⇓B). Likewise, IL-5 synthesis was not significantly affected by the application of siRNAs targeting PDE4A and PDE4B, but was significantly inhibited by knockdown of PDE4D, to an extent close to that obtained with RP73401 (Fig. 8⇓C). Remarkably, the combined application of siRNAs targeting PDE4A, PDE4B, and PDE4D (PDE4_all_si in Fig. 8⇓), produced the most pronounced inhibitory effect on cytokine release. The relatively weak inhibitory effect of RP73401 on T cell proliferation (compare Fig. 7⇑B) was mimicked by PDE4D knockdown, whereas siRNA targeting PDE4A and PDE4B were hardly effective (Fig. 8⇓D). Furthermore, the addition of the latter two siRNAs to PDE4D siRNA did not further increase the inhibitory effect on T cell proliferation. Suppression of CD4+ T cell functions by PDE4 subtype-specific siRNAs. A total of 1.5 μM nontargeting siRNA (NEG_si) or PDE4 subtype-specific siRNAs were nucleofected into human primary CD4+ T cells. Cells were left in culture for 24 h and were then stimulated with 0.3 μg of anti-CD3/well and 0.3 μg of anti-CD28/ml. The siRNA-mediated suppression of IL-2 secretion after 24 h (A), IFN-γ secretion after 72 h (B), IL-5 secretion after 72 h (C), and proliferation ([3H]thymidine incorporation) after 66 h (D) is depicted in percent of the RP73401 effect. This maximally expected effect was determined using cells treated with the nucleofection procedure alone. NEG_si, nontargeting control siRNA; PDE4_all_si, combined application of PDE4A_si, PDE4B_si, and PDE4D_si. Results are expressed as mean ± SD of four to six donors. Significance of differences is indicated: ∗, p < 0.05; ∗∗, p < 0.01; ∗∗∗, p < 0.001; compared with 1.5 μM NEG_si. The aim of our study was to clarify the time-dependent expression profile of the four PDE4 subtypes in CD4+ T cells and to elucidate which PDE4 subtype(s) is/are of importance for T cell cytokine production and proliferation. Because PDE4 inhibitors are tested in clinical trials and may provide future therapeutic options in diseases as asthma, chronic obstructive pulmonary disease, inflammatory bowel disease, and others (22, 37), we wished to closely mimic the physiological conditions relevant to human in our experiments. Consequently, although cell lines such as the Jurkat T cell line are functionally more stable and are easier to handle (e.g., to transfect), we preferred human primary CD4+ T cells for our studies, even though this approach is more time consuming, technically complex, and had a higher variability due to donor-dependent differences. By using quantitative PCR and PDE activity assays combined with an immunoprecipitation protocol, we demonstrate that PDE4A, PDE4B, and PDE4D are expressed in untreated CD4+ T cells, whereas PDE4C was not detected. The highest mRNA expression level as well as PDE4 activity was found for PDE4D, followed by PDE4B and PDE4A, the latter having substantially lower expression level. These findings are only partly in accordance with earlier studies based on semiquantitative PCR experiments. Whereas Landells et al. (38) found high PDE4D mRNA expression in CD4+ T cells, Gantner et al. (39) found PDE4B expression levels above PDE4A, but could not detect substantial amount of PDE4D. Upon anti-CD3/CD28 stimulation, we show a time-dependent up-regulation of PDE4A, PDE4B, and PDE4D mRNA expression and PDE4 activities. Whereas PDE4A and PDE4D were up-regulated within 5 days with the highest expression levels at 120 h (the latest time point measured), PDE4B only showed a transient up-regulation with highest levels 16–24 h after stimulation. In general, the time-dependent expression profiles found for mRNA levels closely resembled the PDE4 activity profiles measured by PDE4 subtype-specific immunoprecipitations. A time delay between changes of mRNA levels and enzyme activities was observed as expected because protein synthesis is subsequent to mRNA transcription. However, some differences were observed in the extent of mRNA and activity up-regulation. Whereas PDE4A showed an ∼15-fold induction and PDE4D an ∼4-fold induction on mRNA level, PDE4 activities increased only 4- and 1.5-fold, respectively. On the contrary, up-regulation of PDE4B activity was more pronounced than PDE4B mRNA up-regulation (3.4- vs 2-fold). Whereas results by quantitative PCR directly reflect the number of mRNA molecules in the cell, PDE activity is not only influenced by the amount of the enzyme but also by other parameters such as phosphorylation and protein-protein interactions. Therefore, changes on the mRNA level may not quantitatively reflect the changes in enzymatic activity. The induction of PDE4 subtypes upon stimulation of T cells in our own experiments is in agreement with other studies (40, 41). In contrast, one study (42) reported that anti-CD3/CD28 stimulation increased PDE4 activity 30 min after stimulation, but did not elevate de novo PDE4 protein or mRNA expression. Contrary to our study, a mixed CD4+ and CD8+ T cell population, shorter stimulation periods, and a semiquantitative PCR strategy were used in the latter study. Human primary CD4+ T cells are a heterogeneous group of different subpopulations, among them naive and memory T cells, which are distinguished by their surface markers CD45RA and CD45RO, respectively (36). These two subpopulations can be separated rather easily and in sufficient numbers. Considering the generally lower activation threshold dedicated to memory effector T cells (43), we asked whether PDE4 subtypes are differentially regulated in these two subpopulations. Although we found a marginally higher PDE4 subtype expression and a slightly faster and more pronounced induction of individual PDE4 subtypes in memory CD4+ T cells, these differences were statistically not significant between naive and memory T cells. Our findings indicate that naive and memory CD4+ T cells express the same set of PDE4 subtypes, and that these PDE4 subtypes are similarly regulated after anti-CD3/CD28 stimulation. Furthermore, the time-dependent expression patterns of PDE4 subtypes in CD4+ cells were not found to be influenced by the strength of the anti-CD3 stimulus or the costimulatory anti-CD28 signal. Although the primary goal of our study was to analyze the different PDE4 subtypes, we assessed whether the observed subtype expression patterns can be attributed to some splice variants. We detected proteins of different lengths in immunoblotting experiments, indicating that multiple splice variants are expressed for each individual subtype. In unstimulated T cells, the Ab directed against PDE4A detected two bands (although the shorter variant resulted in a very faint signal), probably corresponding to short and long forms of PDE4A. However, after stimulation, no long-term increase of the amount of protein was observed. The different immunoblot experiments we performed with the PDE4A Ab (different from the one suitable for immunoprecipitation) showed a somewhat higher variability compared with the experiments performed with PDE4B or PDE4D Abs. This may be a result of the lower expression level of PDE4A. In fact, we were not able to detect a PDE4A signal from T cell extracts using another commercially available PDE4A Ab (FabGennix; Frisco) or using the Ab suitable for immunoprecipitation (data not shown). Additionally, we performed an experiment in which we immunoprecipitated PDE4A with the idea to increase the amount of PDE4A in the sample followed by immunoblot analysis (using the immunoblot Ab). However, because both Abs are derived from rabbits it was not possible to detect a PDE4A signal above the high background produced by the Ab used for immunoprecipitation. Therefore, due to the low expression level and to limited experimental tools we could not resolve this discrepancy. However, one explanation might be that the Ab used for the immunoblot experiments may not have detected all expressed PDE4A splice variants. For the PDE4B and PDE4D subtypes, the mRNA and enzyme activity data as well as the immunoblot data were in good agreement. If one considers the two prominent bands (slightly above 100 kDa and at ∼75 kDa) displayed by the PDE4B Ab, an increase in the overall PDE4B protein amount 24 h after stimulation is comprehensible. A reduction is obvious at later time points. For PDE4D a clear induction is found for the proteins 60–75 kDa in size. Most remarkably, the different splice variants detected for PDE4B and PDE4D are not regulated uniformly. Especially, the immunoblot of PDE4B displays a time-dependent reduction of PDE4B long form(s) paralleled by a pronounced transient up-regulation of the PDE4B short form. The immunoblot of PDE4D shows PDE4D long forms above 85 kDa in size, which are rather unaffected after stimulation. The detected proteins of 60–75 kDa in size may represent PDE4D short forms, which are clearly up-regulated after stimulation. Taken together, the immunoblots supplement the PCR and enzyme activity results. In addition, the data highlight that multiple splice variants further increase the complexity in the regulation of PDE4 subtypes in CD4+ T cells. By evaluating our comprehensive expression data, one can imply that the different expression levels of the PDE4 subtypes in untreated CD4+ T cells and their different induction upon stimulation may have distinct effects on the regulation of T cell functions. For example, the high expression and activity level of PDE4D at all examined time points (0–120 h) may provide a constitutive high cAMP hydrolyzing capacity. PDE4B might be involved in regulating early T cell activation, because PDE4B mRNA and activity showed a substantial but only transient up-regulation. Remarkably, PDE4A, but not PDE4B or PDE4D had the most pronounced x-fold up-regulation of both mRNA and activity. This induction of PDE4A was most pronounced 120 h after stimulation and may thus be involved in undefined long-term processes which are beyond the scope of our examined time window. To study the impact of distinct PDE4 subtypes on CD4+ T cell functions and due to the lack of subtype-specific small molecule inhibitors, we transfected CD4+ T cells with individual siRNAs directed against PDE4A, PDE4B, and PDE4D. Human primary CD4+ T lymphocytes are difficult to transfect and various common transfection methods such as cationic lipids fail to transfect the cells efficiently. We used an electroporation-based transfection method (nucleofection) optimized for the transfection of human T cells (34). Nevertheless, the transfection procedure alone caused a considerable loss of cells, which is a common event associated with electroporation. In our experiments, the procedure also caused a substantial decrease in the release of cytokines if compared with untreated cells. However, cells recovered after nucleofection had a good viability and proliferation of the cells after stimulation was not affected. Taking the unavoidable effects of the procedure into account, it was important to demonstrate that the additional application of siRNAs had no additional effect on cell parameters (besides expected effects linked to PDE4 knockdown). Whereas siRNA concentrations in the range from 100 nM to 4 μM have been used (44, 45, 46), we determined 1.5 μM siRNA as the optimal concentration for maximal knockdown of PDE4 subtypes in our validation experiments. We could not achieve complete knockdown of the target PDE4 subtypes, however, the mRNA and protein knockdown was substantial and all siRNAs had the same efficacy in down-regulating the respective mRNA in unstimulated CD4+ T cells. After stimulation, the applied siRNAs not only had to reduce a stable basal mRNA level but also had to counteract the induction of the respective mRNAs, probably resulting in more variable knockdown effects under stimulatory conditions. Additionally, we also addressed the specificity of the siRNAs in our validation experiments. The siRNAs target sequences that are highly conserved between the PDE4 subtypes. Therefore, each siRNA targeting a specific subtype can be considered as a “high homology control” for the other subtypes. With this respect it is important to note that each individual siRNA specifically down-regulates its respective mRNA and does not affect the other highly homologous subtypes. In our functional studies, PDE4A and PDE4B siRNAs show only limited effects on most of the parameters studied arguing also against general unspecific effects of these siRNAs. The most prominent and consistent effects on all functional parameters were observed for PDE4D siRNA. We performed a limited set of experiments with a second siRNA (PDE4D_si-2) targeting a different sequence of PDE4D. This siRNA was similarly efficient and specific in down-regulating the PDE4D mRNA in unstimulated T cells while leaving the other subtypes unaffected and it was also capable to keep mRNA levels lowered after T cell stimulation (data not shown). Most noteworthy, both PDE4D-siRNAs were almost equally effective in reducing IL-2 secretion 24 h after stimulation (data not shown). Considering our extensive validation of the siRNAs performed with primary T cells and the experiments using a second PDE4D siRNA, the observed functional effects are most likely due to the specific down-regulation of the respective PDE4 subtypes rather than due to unspecific off-target effects. The crucial role of PDE4 in T cell signaling and function is well-known (23, 24). In our study, we used the secretion of IL-2, IFN-γ, and IL-5 and proliferation as functional readout parameters. The maximum inhibition of these parameters by complete suppression of PDE4 activity was determined by the panPDE4 inhibitor RP73401 (piclamilast). We could demonstrate that siRNA-mediated knockdown of both PDE4B and PDE4D resulted in significant suppression of anti-CD3/CD28-induced IL-2 release; the effect of PDE4A siRNA was not statistically significant. These data indicate that for IL-2 synthesis PDE4B and PDE4D may have a partially overlapping function. 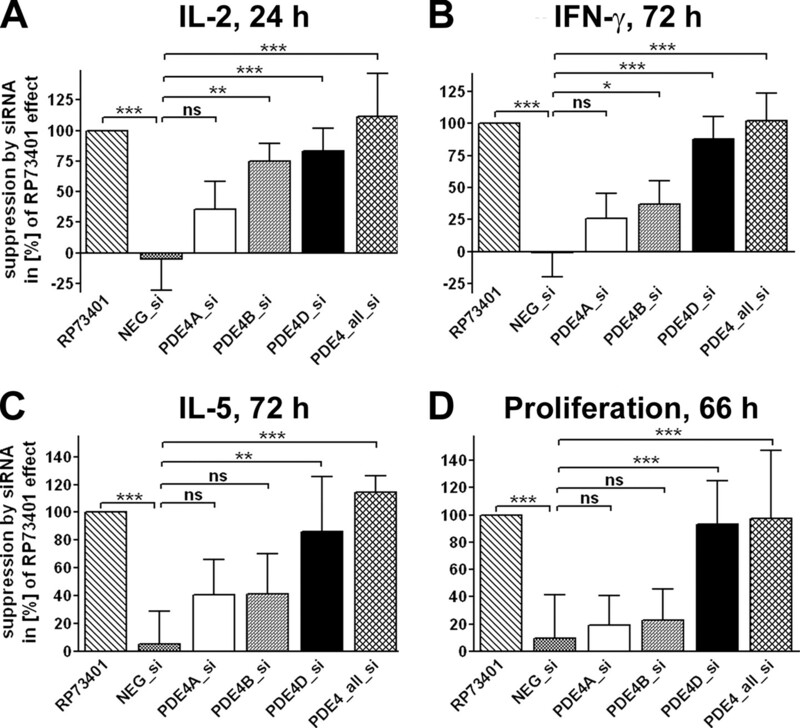 For IFN-γ and IL-5, PDE4D-siRNA had a predominant effect. However, the inhibition of both cytokines was most effective when PDE4 subtype-specific siRNAs were applied in combination, pointing to complementary functions of PDE4 subtypes. The weak inhibition of proliferation by suppression of PDE4 enzyme activity under the conditions applied could be fully mimicked by PDE4D siRNA. In summary, our findings indicate that the regulation and function of individual PDE4 subtypes might be a complex interplay leading to largely nonredundant, complementary, and time-dependent roles. Our results seem to be in discrepancy to a study of Manning et al. (47), who claimed that suppression of T cell proliferation with “PDE4 subtype-selective inhibitors” correlated with the inhibition of PDE4A and PDE4B. This contradiction might be explained by the low selectivity of the inhibitors used in that study and/or by different stimulation conditions. In the Manning study, mononuclear cells from allergic donors were stimulated by Ag. In our own study, we have evaluated the impact of stimulation conditions (anti-CD3 ± costimulation with anti-CD28 in different strengths) and found no differences with respect to regulation of PDE4 subtypes. For our functional studies, we used a “medium” costimulation protocol by applying 0.3 μg of anti-CD3/well and 0.3 μg of anti-CD28/ml. We cannot exclude the possibility that—in contrast to the mRNA expression profiles—the impact of various PDE4 subtypes/splice variants may depend on the stimulation condition used. It may also be that for different stimulation conditions small (undefined) subpopulations of CD4+ T cells may respond differently which cannot be resolved by our protocol. These possibilities will be investigated in future studies. In support of our findings, complementary, but nonredundant roles of PDE4 subtypes have already been described in mice deficient in PDE4B and PDE4D, in which neutrophil recruitment to the inflamed lung is impaired (27). In contrast, ablation of PDE4B alone impacts LPS signaling and decreases TNF-α production in monocytes, dendritic cells, and macrophages (25, 28). So far, the relevance of PDE4 subtypes for T cell function has not been extensively described neither in mice nor in humans. However, in human primary T cells and T cell lines, two reports localize PDE4B2 at the TCR and the immunological synapse (29, 30). A recent study reported that TCR and CD28 stimulation in human peripheral T cells recruits PDE4A4, PDE4B2, PDE4D1, and PDE4D2 in complex with β-arrestin to lipid rafts, pointing to a potential role of PDE4 in counteracting C-terminal Src kinase mediated inhibition of Lck (31). Interestingly, we have found in our immunoblot analyses that especially the short forms of PDE4B and PDE4D are responsible for or contribute to the time-dependent up-regulation of these subtypes in CD4+ T cells. Additionally, Tasken and coworkers (31) confirmed in human primary T cells that PKA-dependent phosphorylation increases PDE4 activity, a mechanism that was already described in several cell systems (42, 48, 49, 50, 51). The well-characterized interactions of PDE4 isoforms with A-kinase anchoring proteins were also found in T cell lines, enabling a local feedback regulation as control for cAMP concentration (52). The combination of several mechanisms, including the up-regulation of the amount of different PDE4 subtypes, the regulation of PDE4 activity by e.g., phosphorylation, and the intracellular targeting of distinct PDE4 splice variants to specific microdomains may be involved in the subtle and complex regulation necessary for opposing the inhibitory tonus of cAMP in inflammatory cells. Our study indicates that in CD4+ T cells this regulation is not mediated by one subtype alone, but that distinct subtypes are time-dependently involved with PDE4D probably playing a predominant role, supporting the concept of PDE4 compartmentalization, both temporally and spatially (20, 53). Detailed information about functionally relevant subtypes in inflammatory cells will help to define the rational basis for the development of subtype-selective PDE4 inhibitors for the treatment of inflammatory diseases. We thank Barbara Burgbacher, Bettina Eidmann, and Sandra Hamm for excellent technical help and Jonathan Gilbert for valuable information. We are indebted to Drs. Hermann Tenor, Hans-Peter Hofmann, and Oliver Steinbach for fruitful discussions and helpful advice. M. Conti is a consultant for Pfizer and has received a research grant from Altana Pharma. ↵1 D.P. is a member of the research training group Graduiertenkolleg 702 and was supported by the Deutsche Forschungsgemeinschaft. Work done in the laboratory of M.C. was supported by National Institutes of Health HD205788 and HL67674. ↵3 Abbreviations used in this paper: PKA, protein kinase A; PDE, phosphodiesterase; PDE4, type 4 PDE; siRNA, small-interfering RNA; NF, nucleofection; Ct, cycle threshold; 7-AAD, 7-aminoactinomycin D; MGB, minor groove binder. Larsen, G. L., P. M. Henson. 1983. Mediators of inflammation. Annu. Rev. Immunol. 1: 335-359. Davis, M. M., P. J. Bjorkman. 1988. T-cell antigen receptor genes and T-cell recognition. Nature 334: 395-402. Veillette, A., S. Latour, D. Davidson. 2002. Negative regulation of immunoreceptor signaling. Annu. Rev. Immunol. 20: 669-707. Kammer, G. M.. 1988. The adenylate cyclase-cAMP-protein kinase A pathway and regulation of the immune response. Immunol. Today 9: 222-229. Skalhegg, B. S., B. F. Landmark, S. O. Doskeland, V. Hansson, T. Lea, T. Jahnsen. 1992. Cyclic AMP-dependent protein kinase type I mediates the inhibitory effects of 3′,5′-cyclic adenosine monophosphate on cell replication in human T lymphocytes. J. Biol. Chem. 267: 15707-15714. Tamir, A., N. Isakov. 1994. Cyclic AMP inhibits phosphatidylinositol-coupled and -uncoupled mitogenic signals in T lymphocytes: evidence that cAMP alters PKC-induced transcription regulation of members of the jun and fos family of genes. J. Immunol. 152: 3391-3399. Selliah, N., M. M. Bartik, S. L. Carlson, W. H. Brooks, T. L. Roszman. 1995. cAMP accumulation in T-cells inhibits anti-CD3 monoclonal antibody-induced actin polymerization. J. Neuroimmunol. 56: 107-112. Torgersen, K. M., T. Vang, H. Abrahamsen, S. Yaqub, K. Tasken. 2002. Molecular mechanisms for protein kinase A-mediated modulation of immune function. Cell. Signal. 14: 1-9. Loza, M. J., S. Foster, S. P. Peters, R. B. Penn. 2006. β-Agonists modulate T-cell functions via direct actions on type 1 and type 2 cells. Blood 107: 2052-2060. Ledbetter, J. A., M. Parsons, P. J. Martin, J. A. Hansen, P. S. Rabinovitch, C. H. June. 1986. Antibody binding to CD5 (Tp67) and Tp44 T cell surface molecules: effects on cyclic nucleotides, cytoplasmic free calcium, and cAMP-mediated suppression. J. Immunol. 137: 3299-3305. Kammer, G. M., C. A. Boehm, S. A. Rudolph, L. A. Schultz. 1988. Mobility of the human T lymphocyte surface molecules CD3, CD4, and CD8: regulation by a cAMP-dependent pathway. Proc. Natl. Acad. Sci. USA 85: 792-796. Lugnier, C.. 2006. Cyclic nucleotide phosphodiesterase (PDE) superfamily: a new target for the development of specific therapeutic agents. Pharmacol. Ther. 109: 366-398. Bender, A. T., J. A. Beavo. 2006. Cyclic nucleotide phosphodiesterases: molecular regulation to clinical use. Pharmacol. Rev. 58: 488-520. Schudt, C., H. Tenor, A. Hatzelmann. 1995. PDE isoenzymes as targets for anti-asthma drugs. Eur. Resp. J. 8: 1179-1183. Giembycz, M. A., C. J. Corrigan, J. Seybold, R. Newton, P. J. Barnes. 1996. Identification of cyclic AMP phosphodiesterases 3, 4, and 7 in human CD4+ and CD8+ T-lymphocytes: role in regulating proliferation and the biosynthesis of interleukin-2. Br. J. Pharmacol. 118: 1945-1958. Li, L., C. Yee, J. A. Beavo. 1999. CD3- and CD28-dependent induction of PDE7 required for T cell activation. Science 283: 848-851. Glavas, N. A., C. Ostenson, J. B. Schaefer, V. Vasta, J. A. Beavo. 2001. T cell activation up-regulates cyclic nucleotide phosphodiesterases 8A1 and 7A3. Proc. Natl. Acad. Sci. USA 98: 6319-6324. Houslay, M. D., D. R. Adams. 2003. PDE4 cAMP phosphodiesterases: modular enzymes that orchestrate signalling cross-talk, desensitization and compartmentalization. Biochem. J. 370: 1-18. Conti, M., W. Richter, C. Mehats, G. Livera, J. Y. Park, C. Jin. 2003. Cyclic AMP-specific PDE4 phosphodiesterases as critical components of cyclic AMP signaling. J. Biol. Chem. 278: 5493-5496. Torphy, T. J.. 1998. Phosphodiesterase isozymes: molecular targets for novel antiasthma agents. Am. J. Respir. Crit. Care Med. 157: 351-370. Lipworth, B. J.. 2005. Phosphodiesterase-4 inhibitors for asthma and chronic obstructive pulmonary disease. Lancet 365: 167-175. Souness, J. E., D. Aldous, C. Sargent. 2000. Immunosuppressive and anti-inflammatory effects of cyclic AMP phosphodiesterase (PDE) type 4 inhibitors. Immunopharmacology 47: 127-162. Hatzelmann, A., C. Schudt. 2001. Anti-inflammatory and immunomodulatory potential of the novel PDE4 inhibitor roflumilast in vitro. J. Pharmacol. Exp. Ther. 297: 267-279. Jin, S. L., M. Conti. 2002. Induction of the cyclic nucleotide phosphodiesterase PDE4B is essential for LPS-activated TNF-α responses. Proc. Natl. Acad. Sci. USA 99: 7628-7633. Mehats, C., S. L. Jin, J. Wahlstrom, E. Law, D. T. Umetsu, M. Conti. 2003. 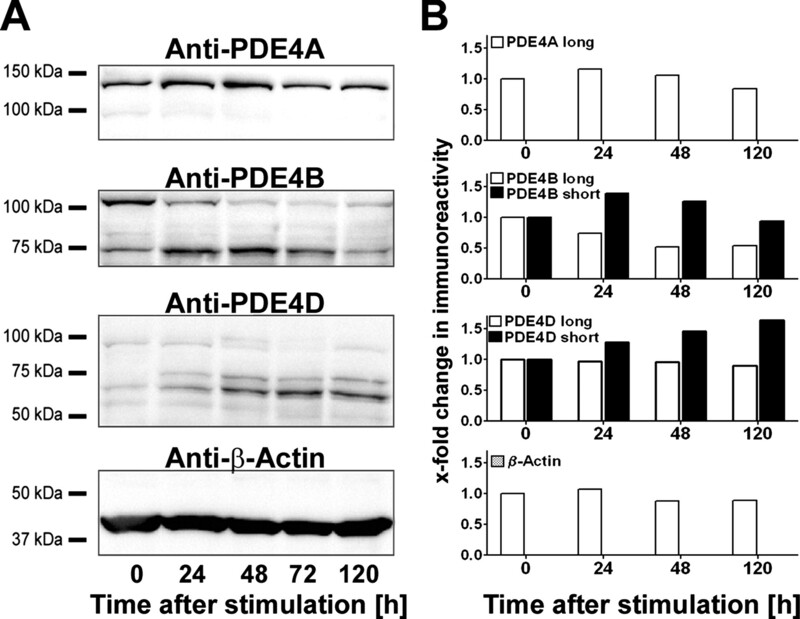 PDE4D plays a critical role in the control of airway smooth muscle contraction. FASEB J. 17: 1831-1841. Ariga, M., B. Neitzert, S. Nakae, G. Mottin, C. Bertrand, M. P. Pruniaux, S. L. Jin, M. Conti. 2004. Nonredundant function of phosphodiesterases 4D and 4B in neutrophil recruitment to the site of inflammation. J. Immunol. 173: 7531-7538. Jin, S. L., L. Lan, M. Zoudilova, M. Conti. 2005. Specific role of phosphodiesterase 4B in lipopolysaccharide-induced signaling in mouse macrophages. J. Immunol. 175: 1523-1531. Baroja, M. L., L. B. Cieslinski, T. J. Torphy, R. L. Wange, J. Madrenas. 1999. Specific CD3ε association of a phosphodiesterase 4B isoform determines its selective tyrosine phosphorylation after CD3 ligation. J. Immunol. 162: 2016-2023. Arp, J., M. G. Kirchhof, M. L. Baroja, S. H. Nazarian, T. A. Chau, C. A. Strathdee, E. H. Ball, J. Madrenas. 2003. Regulation of T-cell activation by phosphodiesterase 4B2 requires its dynamic redistribution during immunological synapse formation. Mol. Cell. Biol. 23: 8042-8057. Abrahamsen, H., G. Baillie, J. Ngai, T. Vang, K. Nika, A. Ruppelt, T. Mustelin, M. Zaccolo, M. Houslay, K. Tasken. 2004. TCR- and CD28-mediated recruitment of phosphodiesterase 4 to lipid rafts potentiates TCR signaling. J. Immunol. 173: 4847-4858. Iona, S., M. Cuomo, T. Bushnik, F. Naro, C. Sette, M. Hess, E. R. Shelton, M. Conti. 1998. Characterization of the rolipram-sensitive, cyclic AMP-specific phosphodiesterases: identification and differential expression of immunologically distinct forms in the rat brain. Mol. Pharmacol. 53: 23-32. Tenor, H., E. Hedbom, H. J. Hauselmann, C. Schudt, A. Hatzelmann. 2002. Phosphodiesterase isoenzyme families in human osteoarthritis chondrocytes—functional importance of phosphodiesterase 4. Br. J. Pharmacol. 135: 609-618. Gresch, O., F. B. Engel, D. Nesic, T. T. Tran, H. M. England, E. S. Hickman, I. Korner, L. Gan, S. Chen, S. Castro-Obregon. 2004. New non-viral method for gene transfer into primary cells. Methods 33: 151-163. Livak, K. J., T. D. Schmittgen. 2001. Analysis of relative gene expression data using real-time quantitative PCR and the 2 (−ΔΔCt) method. Methods 25: 402-408. Bell, E. B., S. M. Sparshott, C. Bunce. 1998. CD4+ T-cell memory, CD45R subsets and the persistence of antigen—a unifying concept. Immunol. Today 19: 60-64. Banner, K. H., M. A. Trevethick. 2004. PDE4 inhibition: a novel approach for the treatment of inflammatory bowel disease. Trends Pharmacol. Sci. 25: 430-436. Landells, L. J., C. M. Szilagy, N. A. Jones, K. H. Banner, J. M. Allen, A. Doherty, B. J. O’Connor, D. Spina, C. P. Page. 2001. Identification and quantification of phosphodiesterase 4 subtypes in CD4 and CD8 lymphocytes from healthy and asthmatic subjects. Br. J. Pharmacol. 133: 722-729. Gantner, F., H. Tenor, V. Gekeler, C. Schudt, A. Wendel, A. Hatzelmann. 1997. Phosphodiesterase profiles of highly purified human peripheral blood leukocyte populations from normal and atopic individuals: a comparative study. J. Allergy Clin. Immunol. 100: 527-535. Seybold, J., R. Newton, L. Wright, P. A. Finney, N. Suttorp, P. J. Barnes, I. M. Adcock, M. A. Giembycz. 1998. Induction of phosphodiesterases 3B, 4A4, 4D1, 4D2, and 4D3 in Jurkat T-cells and in human peripheral blood T-lymphocytes by 8-bromo-cAMP and Gs-coupled receptor agonists: potential role in β2-adrenoreceptor desensitization. J. Biol. Chem. 273: 20575-20588. Jiang, X., M. Paskind, R. Weltzien, P. M. Epstein. 1998. Expression and regulation of mRNA for distinct isoforms of cAMP-specific PDE-4 in mitogen-stimulated and leukemic human lymphocytes. Cell Biochem. Biophys. 28: 135-160. Kanda, N., S. Watanabe. 2001. Regulatory roles of adenylate cyclase and cyclic nucleotide phosphodiesterases 1 and 4 in interleukin-13 production by activated human T cells. Biochem. Pharmacol. 62: 495-507. Vang, T., H. Abrahamsen, S. Myklebust, J. Enserink, H. Prydz, T. Mustelin, M. Amarzguioui, K. Tasken. 2004. Knockdown of C-terminal Src kinase by siRNA-mediated RNA interference augments T cell receptor signaling in mature T cells. Eur. J. Immunol. 34: 2191-2199. Methi, T., J. Ngai, M. Mahic, M. Amarzguioui, T. Vang, K. Tasken. 2005. Short-interfering RNA-mediated Lck knockdown results in augmented downstream T cell responses. J. Immunol. 175: 7398-7406. Skapenko, A., J. Leipe, U. Niesner, K. Devriendt, R. Beetz, A. Radbruch, J. R. Kalden, P. E. Lipsky, H. Schulze-Koops. 2004. GATA-3 in human T cell helper type 2 development. J. Exp. Med. 199: 423-428. Manning, C. D., M. Burman, S. B. Christensen, L. B. Cieslinski, D. M. Essayan, M. Grous, T. J. Torphy, M. S. Barnette. 1999. Suppression of human inflammatory cell function by subtype-selective PDE4 inhibitors correlates with inhibition of PDE4A and PDE4B. Br. J. Pharmacol. 128: 1393-1398. Sette, C., M. Conti. 1996. Phosphorylation and activation of a cAMP-specific phosphodiesterase by the cAMP-dependent protein kinase: involvement of serine 54 in the enzyme activation. J. Biol. Chem. 271: 16526-16534. Ekholm, D., P. Belfrage, V. Manganiello, E. Degerman. 1997. Protein kinase A-dependent activation of PDE4 (cAMP-specific cyclic nucleotide phosphodiesterase) in cultured bovine vascular smooth muscle cells. Biochim. Biophys. Acta 1356: 64-70. MacKenzie, S. J., G. S. Baillie, I. McPhee, C. MacKenzie, R. Seamons, T. McSorley, J. Millen, M. B. Beard, G. Van Heeke, M. D. Houslay. 2002. Long PDE4 cAMP specific phosphodiesterases are activated by protein kinase A-mediated phosphorylation of a single serine residue in upstream conserved region 1 (UCR1). Br. J. Pharmacol. 136: 421-433. Laliberte, F., S. Liu, E. Gorseth, B. Bobechko, A. Bartlett, P. Lario, M. J. Gresser, Z. Huang. 2002. In vitro PKA phosphorylation-mediated human PDE4A4 activation. FEBS Lett. 512: 205-208. Asirvatham, A. L., S. G. Galligan, R. V. Schillace, M. P. Davey, V. Vasta, J. A. Beavo, D. W. Carr. 2004. A-kinase anchoring proteins interact with phosphodiesterases in T lymphocyte cell lines. J. Immunol. 173: 4806-4814. Baillie, G. S., J. D. Scott, M. D. Houslay. 2005. Compartmentalisation of phosphodiesterases and protein kinase A: opposites attract. FEBS Lett. 579: 3264-3270.